I played golf today in a client’s foundation golf tournament and shot pretty well. After people see me drive the ball far down the fairway, they inevitably ask me how often I play. The answer is, not much, perhaps five to 10 times a year. Not that I don’t love the game, I do. In fact, if I had to cherry-pick my dream career and start all over again, being a touring golf pro would be hard to beat. My problem is time: Running my own company keeps me glued to my computer and phone. That, and I don’t belong to a club. 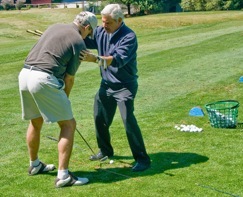 Chris David, right, squaring my shoulders at High Hampton Inn golf lesson. I did, however, get a golf lesson last year that was the best ever. I’ve probably had four or five lessons in my life. I still have notes the pro wrote from one in high school and I have the videotape from an afternoon I spent at a Hilton Head vacation golf session. So when I accompanied my wife on a travel writers trip to the High Hampton Inn in Cashiers, NC, I was eager to learn that I could take a free golf lesson, even though I was a tagalong. I had nearly two hours with High Hampton’s golf pro, Chris David. He not only explained what I need to do to improve my swing, he also explained the whys – the philosophy behind the golf swing. Suddenly it made so much more sense to me. In fact, Chris’ analysis of my golf swing rang a familiar bell. My approach to golf is apparently similar to the same critique other professionals have made of other parts of my life: my dancing, my public speaking and my opening up in intimate relationships. In all of them, counselors or instructors have told me I hold back, that I need to loosen up, put more of me into what I’m doing. Ah, the lessons you learn later in life … If only I had taken these lessons to heart earlier. While I only played golf twice during the summer, I did get to play golf two days this week – both games had been postponed by the September floods in Atlanta brought on by weeks of rain. 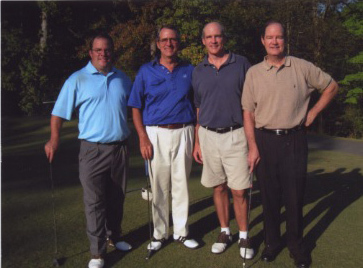 The other time I played with my brothers, Jack and Mike, and my nephew John Waddy. Nephew John Waddy, with brother Jack, me and brother Mike. But my favorite golf memory is when Jan and I visited my son Thomas in Scotland, when he was enjoying a semester abroad in Edinburgh, Scotland. Thanks to Jan’s travel writer connections, we were able to stay in the Old Course Hotel in St. Andrews, overlooking the Old Course, of course. While we didn’t call in time to get a tee time on that course, we did get to play the adjacent Duke’s course. We were treated to an array of Scottish weather: sun, clouds, rain and wind. What would Scottish golf be without it? Thomas and I did get to pose on the famous bridge on the Old Course’s 18th hole. On Sundays, the course is closed and is open to the public to walk around at will. For such a storied tradition, I was surprised but happy to learn that the famous course is, after all, a public park – and on Sundays, everyone can walk it as if they were Bobby Jones or Tiger Woods. I’m still not that great at golf. When I get to the greens I inevitably have an errant chip or a three-putt, but my approaches in the fairway are much more impressive now. And now I do try to throw myself all the way into it. Dancing, eh, that’s still is another thing. Maybe Chris can help me with that, too! 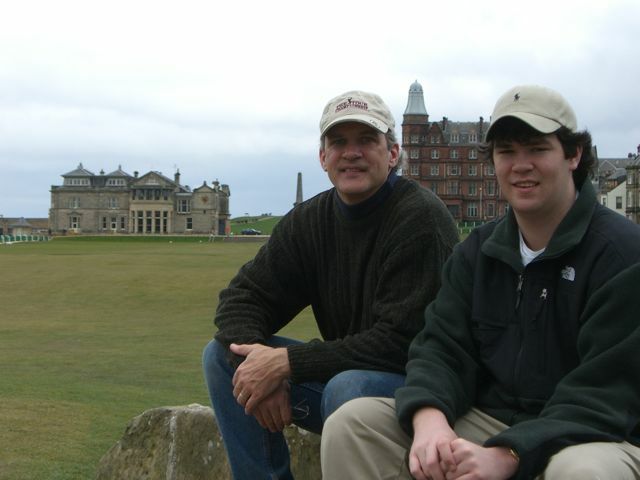 On the course at St. Andrews with my son, Thomas, right. You are currently browsing the Ink by the Barrel blog archives for October, 2009.